Dutch prosecutors have recommended acquitting leading anti-Islam politician Geert Wilders on all five charges of hate speech. They said his comments had targeted Islam, not Muslims, and he had the right to comment on social issues. The trial will continue next week and judges may still disagree with the prosecution and convict Mr Wilders. Prosecutors were obliged to look at the case again after an appeals court decision last year. 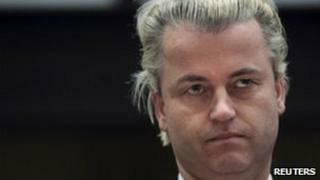 The trial of Mr Wilders, who compared the Koran to Hitler's Mein Kampf, has gripped the Netherlands. His Freedom Party's support is crucial to the country's new coalition government. Prosecutors had initially declined to press charges against Mr Wilders in June 2008. But they were ordered to do so in January 2009 by the appeals court, which ruled that there was significant evidence that the politician had sought to "sow hatred". Prosecutors Birgit van Roessel and Paul Velleman reached their conclusions on Friday after studying interviews with, and articles by, Mr Wilders as well as his anti-Koran film Fitna. "Criticism [of religion] is allowed," Ms van Roessel told the Amsterdam district court. "It would be hurtful to many Muslims when Wilders calls for a ban on the Koran but the feelings of this group can play no role in determining the facts of the case." Mr Velleman told the court that most of the politician's remarks seemed to have targeted Islam as an ideology rather than singling out Muslims for abuse. Mr Wilders is accused of inciting hatred against Muslims and inciting hatred against Moroccans specifically as well as non-Western immigrants. Since receiving death threats, Mr Wilders has had 24-hour state protection. A week ago, a centre-right coalition was formed in the Netherlands between the Liberal and Christian Democrat parties, to rule as a minority government dependent on the support of the Freedom Party in parliament. While the party of Mr Wilders will remain outside government, the new coalition says it plans to ban the full Islamic veil in the Netherlands.